Click here if you have a story to share. 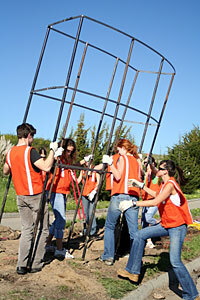 Members of Dee Hibbert Jones's 'Memory' class erect "Land-Fill," a public art project at the Santa Cruz Landfill. “Land-Fill,” a public art project that’s being conceived and fabricated by members of Dee Hibbert-Jones’s ‘Memory’ class, will be unveiled at an opening reception on Earth Day, April 22. 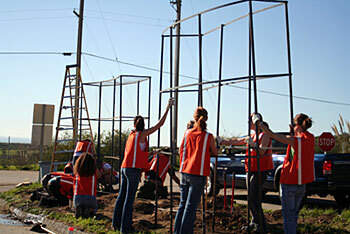 The completed piece, which is being assembled at the Santa Cruz Landfill, will incorporate recycled and waste materials collected by the students. It will explore the relationship of discarded objects to memory, and question perceptions of waste and an object’s intrinsic value. Hibbert-Jones, a member of the City of Santa Cruz Public Art Committee, envisioned the project through her experience as an artist-in-residence at San Francisco Recycling & Disposal. She is currently developing a Public Arts program at UCSC. The project is sponsored by The City of Santa Cruz Public Art Committee in collaboration with UCSC and the City Public Works Department. The Public Art Committee is a city advisory body established in 1998 to use 2% of funds allocated for public capital improvement projects to enrich the city with public art for the local community and visitors. Other recent projects include the installation of artwork at Depot Park and the twenty “graphic traffic boxes,” visible around the City. The Public Art Committee is working on incorporating artwork into the Mike Fox Skate Park. To learn more about the “Land-Fill” project or to communicate with the Public Art Committee visit www.ci.santa-cruz.ca.us/pr/pac/pac.html.